The Apocalypse Trigger, by Douglas Misquita, is the third consecutive action-packed novel by this author, after Haunted and Secret of The Scribe. I was supposed to publish this review a couple of months ago, but, then I got caught up with work and health issues, so never got around to it. This book deserves a shout-out on my blog though. It is another one of those rare gems that I would LOVE to see as a movie! From his very first book, Misquita emerged as a skilled storyteller, setting high expectations among his readers, and this third book only adds to his credibility as an author. In 1947, a freighter in the Malacca Straits sends out a macabre distress signal. When help arrives all the officers and crew are found dead - with no visible signs of injury. Present day: An environmental disaster in British Colombia pits Billy Bradford against Future Energy Group and its ruthless head of security, Luc Fortesque. A devastating terror strike on the world's grandest luxury hotel has the globe clamoring for the head of the mastermind, Sebastian Gardner. But the three men will soon become pawns in a plot that dates back to the end of World War II and the collusion between a powerful, centuries-old cabal and a rogue priest. The Apocalypse Trigger, by Douglas Misquita, is yet another fast-paced adventure thriller with excellently scripted action scenes. The plot spans across time and international borders. The story revolves around struggle for power, world dominance, terrorism and vengeance. There are a lot of characters in the plot, some with slightly bigger roles than the others. They are all important to the story. Written in Misquita's signature style, The Apocalypse Trigger introduces a lot of seemingly unrelated characters and events in the beginning of the narrative, and then goes on to connect them all in the latter part of the book, in a gripping climax. Now that I know that this is how he writes, I make sure that I pay attention to everything, right from page one, because otherwise, I'll end up flipping back through pages, looking for the missed "dots". Misquita's attention to detail speaks of research well-done. You can almost visualize the scenes unfolding in front of your eyes. As a matter of fact, I'm quite surprised that none of his books have caught the eye of any Hollywood producer yet! My rating: 4.5 out of 5. 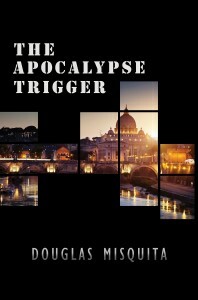 The Apocalypse Trigger, by Douglas Misquita, is a must-read page-turner for all action lovers. It will be almost impossible to put this book down once you've started on it. Disclaimer: I received a free copy of this book for reviewing, but that has, in no way, affected my rating and opinions.